Walk Off The Earth: Joel Cassady, from left, Gianni Luminati, Sarah Blackwood, Mike Taylor and Ryan Marshall. This Canadian band is both wildly popular, and yet somewhat under the radar. The band is called Walk Off The Earth, and its music business journey has been executed by taking an atypical path towards stardom. "We're all from the same town and the town, it has a very good music scene," Sarah Blackwood said. "It was basically after that video where we all sat down and said like, 'OK, we're officially all a band now. Everyone else quit your old other band and let's, let's roll with this because it's pretty amazing,' " she said. The band's live take of Gotye's song is exceptional by the fact that all five band members are holding, playing and drumming on one guitar. Blackwood is married to bandmate Gianni Luminati, and in the six years since that video, she's had two children. The band does plenty of their own songs, but they're also known for doing other artists' songs, including Madonna's "Material Girl." She was quite a few months pregnant when the video was shot. WATCH | A cover of Madonna's "Material Girl"
In the video, Blackwood danced up and down the stairs of a two-story house wearing overalls that could not be buttoned on the side due to the pregnancy. A subsequent video was shot right before her second child was born. "I was actually in labor when we shot 'I Can't Feel My Face.' We did a cover of that Weekend song, and I was in labor when we shot that video," she said. 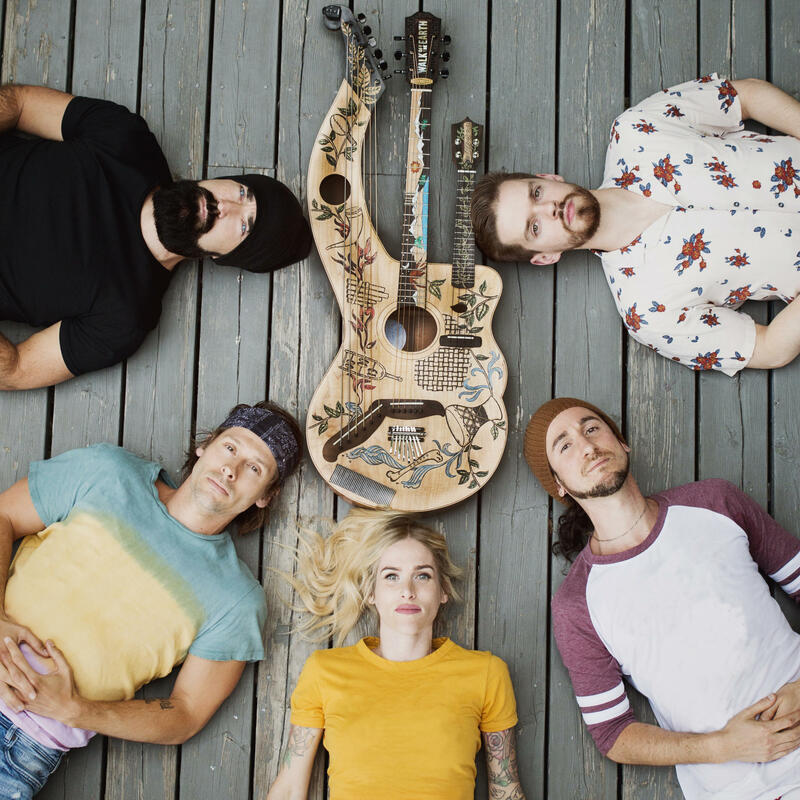 From upbeat covers to equally upbeat original songs, when scrolling through Walk Off The Earth’s music video catalog, a pattern emerges — and it’s not by accident, Blackwood said. "We want to live the most positive life that we can, you know. So that's what we promote. That's what we live; that's what we write about; that's what we create — art based around positive vibes," Blackwood said. WATCH | The Weekend's "I Can't Feel My Face"
That positive vibe especially comes through in a video for a song called, "Alright." “Gianni's sister owns a dance studio where we're from, and we met this amazing little boy ... Elliot, who was transitioning to become a girl,” she said. “And we just were so inspired by her strength, too, because she's only nine or 10." The video shows a young boy wanting to dance in a school talent show as a girl. Despite his parents’ outrage, in the end, she gets her wish. "For me as a mother, as a parent, I want my kids to grow up in, in a world where they don't have to feel fear and shame,” she said. “I think we've come a really long way since, even since when I was little." Another video features all five members playing one instrument — but they're playing an instrument you've never seen before. "It's called a guitharplele,” she said, “and we designed it with his company called Blueberry Guitar. It's the only one in the world." The guitharplele is is a guitar, a harp and a ukulele.
" 'Can we mash them all together and then do a bunch of like little percussion things on the one side so we can play drums on it at the same time?' And they were just like 'OK' ” she said. “It took us about eight months to design and for them to build it. But it's a pretty cool instrument. We have it on the road with us." The road takes them Tuesday night to Stubb's Barbecue in Austin. "I can't wait to get to Austin. I love Texas so much,” she said. “We haven't been there in so long." She makes big promises about their live show.